« can it really be almost 5pm and no posts on the busblawwwwg? wanna know what the space shuttles gonna put on the moon? wanna know what tunes theyre gonna rock to on their way? wanna know where you can get the demos of some of their greatest hits? Well here it is at long last, Tsar’s famous (and amazing!) Drugboy Tapes, in which Jeff W. and Daniel had been trying to get a band together for like a year in Los Angeles in 1998, but they couldn’t get anything going, so they quit their temp jobs, bought a bunch of recording equipment from Guitar Center with Jeff’s stepdad’s credit card, and then spent a whole month in their tiny apartment (on the corner of Lyman Place and Clayton Avenue) doing nothing but writing and recording the songs that ended up later making up the main part of Tsar’s first record—and then they returned the equipment to Guitar Center for a full refund cause it hadn’t been 30 days yet. They recorded on a ¼ in. reel-to-reel tape machine that they had gotten a hold of, but they didn’t really know how to use it, so they tried their best. According to Daniel, they used a combination of live drums and drum machines, and live guitar and keyboards, and banging on things, like a glass of water. Even after buying stuff at Guitar Center, they still didn’t have a lot of equipment, so they did all kinds of experimenting to try to get crazy sounds! For example, on “The Girl Who Wouldn’t Die,” Jeff W. played the basic notes on a Casio keyboard while Daniel spun the knobs on a delay pedal, and that’s how they got those weird science fiction sounds! (Later, when they made their big expensive album, that’s how they did it again!) Also, on that same song, Jeff W. spent all afternoon hyperventilating so that he could hold that really long note that happens twice. Basically, they would try anything to see if it would work, like hooking up their VCR to the machine to get that opening guy on “Afradio.” And one time, the guys decided that everything sounded better coming out of this boom box they had (which they called the Afradio), so they mixed a song onto cassette and then played the cassette out of the boom box and put two microphones next to the boom box speakers, and recorded that! As far as the “lo-fi” sound that the recordings have, it turns out that Jeff W. was really excited about AM radio-sounding music for a while. He thought songs like “Monster Mash,” “Kung Fu Fighting,” and “Spice Up Your Life” sounded better on Radio Disney, which was an AM radio station at the time (and still might be for all I know; I don’t listen to Radio Disney), so he would “squash” all the sounds with a compressor whenever Daniel wasn’t paying enough attention. (They even did a new Drugboy-style remix of “Silver Shifter,” which they had recorded a couple months earlier.) The method makes all the Drugboy recordings sound kind of weird when you first start listening to it, but then your ears get used to it or something, and then you kind of like how it sounds. All of these changes happened kind of all at once, and Tsar still had a bunch of concerts booked coming up in a couple of days. They had to act fast! First they got Jeff S. to join, and then Steve to join, too, but they only had one day to practice before their first show, which was on the radio at a station called KXLU at the campus of Loyola Marymount University. The last two songs of this album are from that first-ever concert by the guys who would make up Tsar, after only one practice! Incredible! 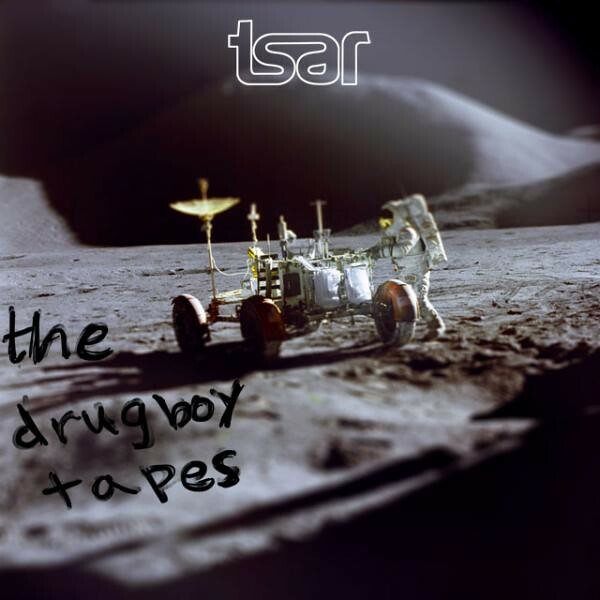 Anyways, I hope you enjoy Tsar’s The Drugboy Tapes! I used to listen to it all the time in my room and in my friend’s car- it just goes to show you you never know what’s gonna happen! can it really be almost 5pm and no posts on the busblawwwwg?